All you need to know about the level of interest in DMAI’s globally-developed DestinationNEXT project is this: the Phase I report was downloaded over 10,000 times. At its core, the project focuses on defining the role and future opportunities for destination marketing organizations in the increasingly competitive and disruptive world of tourism. DestinationNEXT Phase I draws the map for the DMO future. 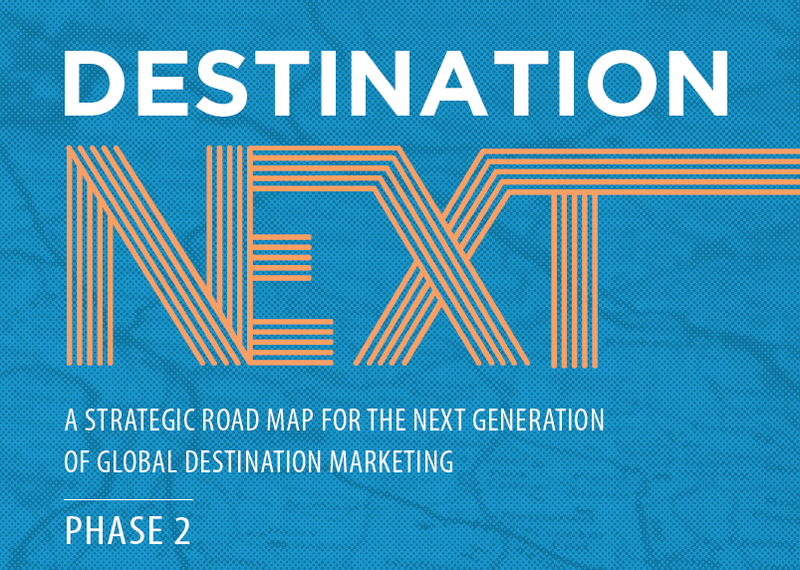 DestinationNEXT Phase II gives DMOs a tool to find themselves on that map and then discover their own pathway to sustainable future success. The key Phase II deliverable is a diagnostic self-assessment tool that plots a destination’s perceived performance relative to the identified success drivers of destination strength and community support engagement in the Phase I performance quadrant-scenarios. 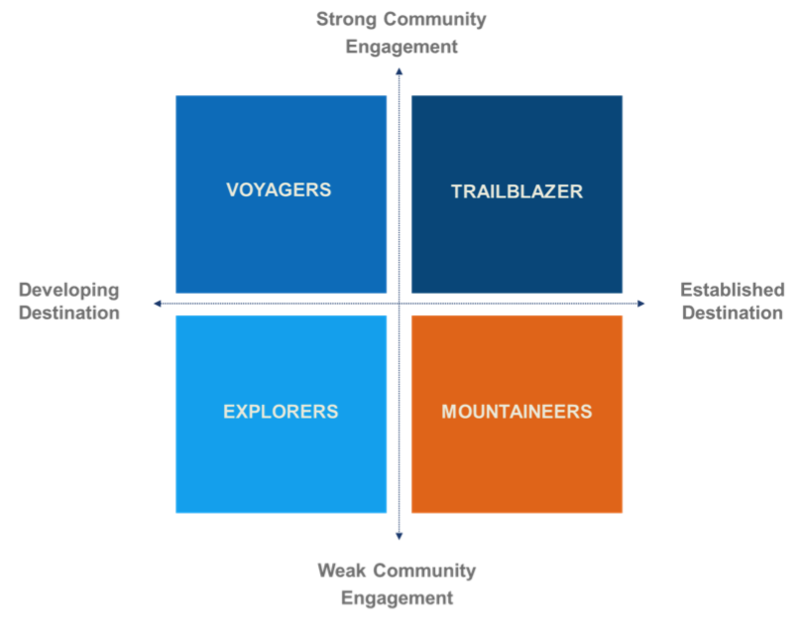 The plot is developed through on-line response-assessments to 20 critical destination variables from single or multiple DMO leaders/stakeholder-users . The variables themselves are weighted based on relative importance and perceived importance from input by destination stakeholders. This helps customize the response for each unique destination. The resulting Diagnostic Report is a strategic conversation-starter for DMO leaders and their stakeholders to seek answers to the question: “where do we go from here and how do we get there?”. To offer DMO leaders food for thought on their journey, Phase II envisions the creation and ongoing development of a Community of Practices (“COP”) to which DMOs can contribute and share practices that can help guide a DMO along their prospective future strategic pathway. To kick-start its activation, the Phase II report includes a “Practice Handbook” of 20 BEST (current state) and 10 NEXT (future state) practice case studies that were harvested from extensive research as well as through globally crowd-sourced DMO submissions. Recognizing the diversity of the DMO universe, all the practices provided probably will not appeal to everyone. But by parsing the practices by budget, by geography, by business focus — with each practice providing an indication of its impact on destination strength, community support/engagement or both – there’s something for everyone. The report also “packages” the practices according to the identified Phase I Transformational Opportunities to further assist with strategic focus. It’s by no-means an exhaustive list, but it is definitely directional…if not inspirational in many cases. 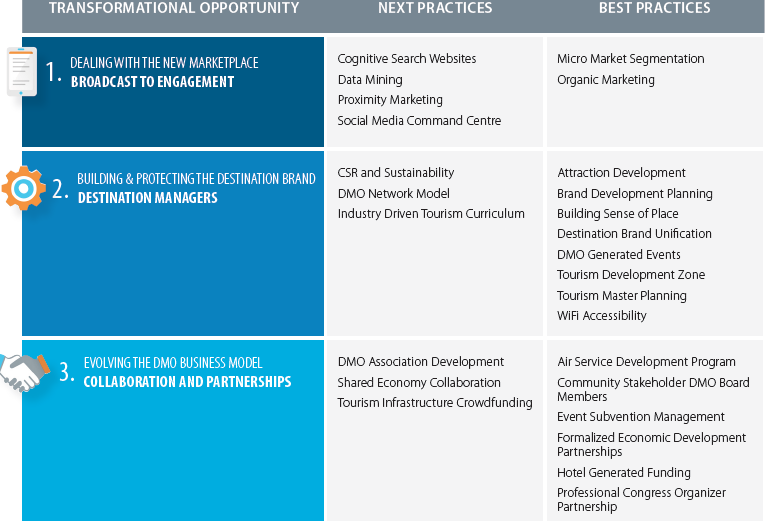 The COP has the potential to be an extremely valuable enduring legacy from the DestinationNEXT project and DMAI would do well to nurture its ongoing development as THE body of knowledge for the destination marketing profession. Reading the report is a good start. But if you are truly committed to considering the insights from DestinationNEXT, you need to take the diagnostic and see where you stand. DMAI is promising to organize workshops for members to understand how to use the diagnostic tool and the COP. From there it’s up to DMO leaders to discover their own pathway to the future. There’s no secret DestinationNEXT formula for assured DMO success in here. It was never intended that way. It is a tool to inspire destination marketers to stop and take a look around at what others are doing today and see what they might be missing for tomorrow. Its an opportunity to discover a new pathway to the future for the destination and for the DMO. And as with every great leadership journey, it starts with the courage to act. This entry was posted in Destination Marketing by Bruce MacMillan. Bookmark the permalink.